Like many American directors who emerged in the early 1970s, Terrence Malick went to film school—to the American Film Institute, where, indeed, his fellow students included Paul Schrader and David Lynch. But unlike many film school graduates, Malick arrived there, in 1969, with an already rich and varied past—in the study of philosophy (he translated a book by Martin Heidegger) and in journalism (Newsweek, the New Yorker). He also arrived with a script fully worked out down to the last detail: Badlands, a “criminal lovers on the run” tale inspired by the exploits of real-life teen killers Charles Starkweather and Caril Fugate. Immediately after graduating, he began taking studio script writing and rewriting assignments (he even worked on an early, discarded draft of Dirty Harry). But, determined to bring his long-conceived first feature to the screen, he was simultaneously pushing to get Badlands produced as a truly independent, “on the run” project, gathering financing through a partnership with several investors and ultimately shooting with a nonunion crew on a budget of less than $350,000. Warner Bros. released it to great acclaim in 1973. Today, with the hindsight allowed by Malick’s more recent The Thin Red Line (1998) and The New World (2005), it is clear that it was Days of Heaven, not Badlands, that truly announced his characteristic style and manner of filmmaking. Where his debut was tightly scripted, its successor was, deliberately, a much more loosely structured affair. Malick gave himself the freedom to shoot material not always centered on the lead actors, but also on the land, animals, little spectacles with groups of extras . . . with the intention of finding the best final form for the whole in postproduction (sound editing being as crucial as picture editing to his work). He has taken this approach to greater and ever more adventurous lengths in his subsequent films. While some industry-minded pundits tut-tut Malick’s preferred shooting method as wasteful and unfocused, it is an entirely valid creative process that aims—as in the cinema of Wong Kar-wai or Jacques Rivette—to discover the film in the course of its material making, rather than in the “abstract” phase of its writing. Writing, of course, remains important for Malick, who is an extraordinary word stylist. The shooting script of Days of Heaven does not much resemble the finished film—in many cases, elaborate dialogue scenes have been reduced in editing to a line or two, a mysterious reaction shot, and a cutaway to some natural phenomenon. The literary qualities of the project are, however, already evident on the page: the richly stylized and poetic vernacular of ways of speaking, the expressive cycle of seasons, and an elemental story line that is derived (in its essence) from various biblical sources. But this primal, mythic story ends up as thoroughly displaced as the legend of John Smith and Pocahontas in The New World. It is hardly surprising to learn that Shepard (who is a superbly haunting presence in the film) thought himself to be playing someone who was less a flesh-and-blood, three-dimensional psychological character than a kind of sketch, silhouette, or ghost. The Australian critic Meaghan Morris once suggested that Days of Heaven is a film in constant motion, and indeed about movement in all its forms: human, natural, mechanical. Cinematographer Nestor Almendros—whose work on François Truffaut’s similarly “triangular” costume drama Two English Girls (1971) may well have inspired Malick—loved to describe the form of the film’s complex setups: the camera tracking and dollying in and through, up and down the farmer’s house, this odd mansion plunked in the middle of a vast field, while various players enter and exit the frame in elaborate choreography. 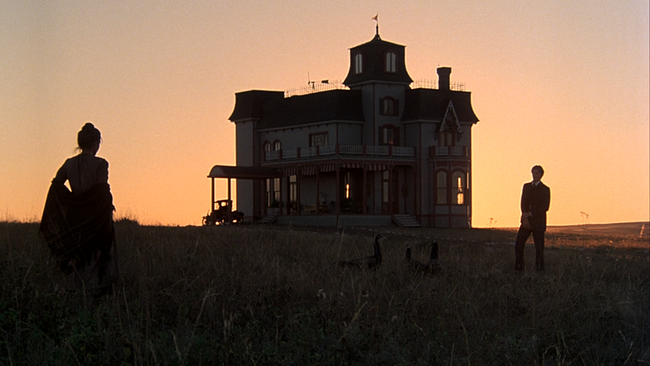 In fact, even the simplest shots have a trace of this type of structure: the mise-en-scène of Days of Heaven aims less at fluid continuity between images or gestures—indeed, it is a remarkably elliptical film—than at the creation of each filmic “unit” as a cell that refers, in a nonlinear way, to all other parts of the film, via echoes, comparisons, subtle flashbacks, and flash-forwards. Malick’s underlying aesthetic aim—one he shares with several great directors, and which was already evident in Badlands—is to encourage the proliferation of a wide range of moods, sights, sounds, and surface textures, while simultaneously arriving at an overall, unifying form. Nothing expresses this better than one of the most beloved elements of Days of Heaven, its play of different musical “inputs,” those Malick appropriated alongside those he commissioned: the music veers from classical to folk, but what holds the ensemble together is that Ennio Morricone’s grave score literally inverts the melody of Saint-Saëns’s Carnival of the Animals. One reflects the other, just as land and sky reflect each other in those characteristic Malick panoramas bisected by the horizon line. Malick’s films have sometimes been frozen, by those unsympathetic to them, into pious homilies or grand statements: Man versus Nature, the redemptive path to God via love and sacrifice, the corrupting effects of Civilization encroaching upon an idyllic Wilderness . . . Yet nothing is so certain or schematic in his work. As always, everything is in motion, seeming opposites ceaselessly transforming each other. Days of Heaven shows us, in myriad inventive ways, how nature and culture are always intertwined, how a certain kind of technology, a certain kind of civilizing process, is part of even the humblest garden arrangement, the most elementary use of a cloth to cover the body, the fashioning of a piece of a tree to make music . . . This is part of the deep Heideggerian legacy in Malick: there is no pure Being, only the action of hands upon the world, fashioning (for better or worse) a living space, a temporary arrangement of people and materials. And those “cosmic” shots that conjure heaven and earth gazing at each other as in a mirror: these are far from constituting a reassuring New Age bromide. Malick resembles, at one level, the tragic philosopher Simone Weil: the God in heaven in whom she so fervently believed was not, in her view, by our side and guiding our every step, but rather someone very far away, discernible only as a distant echo, someone who had set in motion a terrible Destiny Machine that would first bring us pain, separation, betrayal, and wars before it delivered us any faint or fleeting redemption. Malick is a true poet of the ephemeral: the epiphanies that structure his films, beginning with Days of Heaven, are ones that flare up suddenly and die away just as quickly, with the uttering of a single line (like “She loved the farmer”), the flight of a bird or the launching of a plane, the flickering of a candle or the passing of a wind over the grass. Nothing is ever insisted upon or lingered on in his films; that is why they reveal subtly different arrangements of event, mood, and meaning each time we see them. Because everything is in motion, everything is whisked away quickly, and the elements of any one cellular moment are very soon redistributed and metamorphosed into other moments. Just look at and listen to the last minutes of Days of Heaven, with their split-second swing between end-of-the-line melancholic emptiness and wide-open possibility, for a sublime illustration of this ephemerality, which is miraculously caught and formalized in the language of cinema. Adrian Martin is senior research fellow in film and television studies at Monash University in Melbourne and coeditor of Rouge (www.rouge.com.au). This piece originally appeared in the Criterion Collection’s 2007 DVD edition of Days of Heaven.